The second in the R&D series of releases from Disinformation. 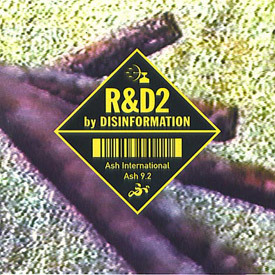 The pioneering Disinformation* Research and Development series continues with the release of R&D2 on Ash International [R.I.P.] – a new CD of geomagnetic, space physics and atmospheric-electrical recordings. Featuring the sounds of phenomena produced by electrical and magnetic storms, solar coronal mass ejection, tropical and local lightning, and also featuring contributions from Oubliette, Network South East, Eurostar, the Central Electricity Generating Board and the Royal Navy – R&D2 represents a unique approach to maximising the creative potential of radio science. Disinformation publications have been favourably compared to the explorations of submariner Jacques Cousteau. R&D2 cover artwork is derived from the Antiphony Video Supplement – images from the Disinformation 1997 UK Tour – the ruined remains of the RAF Air Defence Experimental Establishment acoustic early-warning system. “Beautiful, majestic. A near-definitive statement from this unique documentary recordist and sound artist. This collection of further Research and Development investigations comprises ‘Space Physics, Atmospheric Electricity and Geomagnetism’, and I guarantee your whole being will be given such a shaking that your soul will vibrate back into tune with your lost cosmic brother…you will find (particularly on the recordings of the National Grid or solar emissions, for example) that you are hearing something bigger than you are, a massively scaled thing that will crowd you out of your house. It’s something so apart from everyday experience, and yet in such a different league to any contrived ‘Cosmic’ music that a thousand space-cadet festival Gong fans would be crushed to death by it. The intentions of Joe Banks are quite removed from any of that, almost nothing to do with making music. The somewhat self-effacing Banks once laughingly said that if anyone went and bought the same powerful radio equipment he had, they could produce the same effects easily. Perhaps it’s just the extreme amplification that makes it seem like a gigantic form of feedback music to some people. Banks feels his methods are quite transparent, and lists (with meticulous precision and detail) all the sound sources and the equipment he used to monitor them; in the same way, Ordnance survey map references are given for the sites of antiquated military research that he visits. Only on track 16, ‘National Grid’ can I detect any evidence of a gestural intervention from the artist, as he modifies the sound ‘live’ using an upper and lower slide-band morse code filter. I’m persuaded that this is more than just achieving An effect. It’s arguable that most of the other recordings are simply documents, without intervention. But – breathtakingly – what an astounding scale everything is conceived on. A piece can include an unwitting ‘collaboration’ from passing trains (identified with the usual precision as Network South East or Eurostar vehicles), or the Royal Navy sending out signals to nuclear submarines; their interventions vary the noise signals and ‘contribute’ to the piece. The United Kingdom can thus be seen as a large network of mundane and functional activities, all unco-ordinated and unrelated to each other, until Bank intercepts the electric signals they happen to generate and captures them in his Disinformation net. This is (I would claim) more than simply serendipity, but an artistic intervention with a near-invisible aspect of the environment on a large scale, generating formidably powerful artworks. If anyone comes close, it might just be Christo with his Running Fence or wrapping projects.